The Seat Arona's wheel-arch cladding, large-diameter wheels and rubber side skirts give it a robust appearance. Seat is aiming its Arona subcompact crossover at customers living in cities and metropolitan areas who don't need off-road functionality. It has no four-wheel-drive version, although its 190mm ground clearance allows for driving on some rough roads. The Arona is a vehicle for the "the urban jungle," Seat design chief Alejandro Mesonero said. Seat chose a relatively conservative styling for the Arona to give it a broad appeal, unlike some rivals that have opted for a non-conventional look, such as Nissan with the Juke. Seat designed the Arona to have the distinct feel of a crossover but also to offer a "sturdy car" for everyday life, Mesonero said. 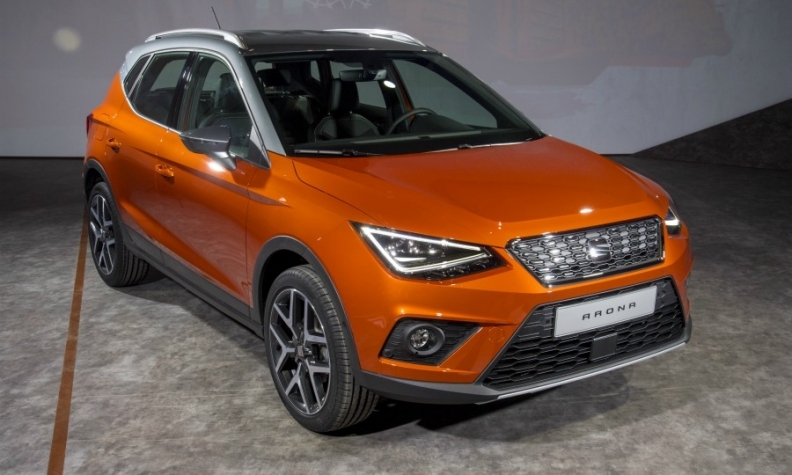 To give the SUV a "tougher and taller" appearance, Seat gave the Arona features such as wheel-arch cladding, large-diameter wheels and dark-colored rubber side skirts, as well as a roof rack and a metal skid plate under the grille. The Arona will be a key element in the brand's product offensive, which started with new versions of the Ibiza and Leon hatchbacks and has helped the once-ailing brand back to profitability. From having no SUVs, Seat now has two, with the Arona in the subcompact segment and the Ateca in the compact sector. Both give the Volkswagen Group brand a firm footing as SUVs continue to gain popularity. Seat also plans to launch a midsize SUV next year. "The Arona is the younger brother in our SUV range and will allow us to take a big leap forward in the European market," Seat President Luca de Meo said. The Arona is the first crossover to use parent VW Group's MQB A0 platform, which also underpins the Ibiza and the new VW Polo. VW brand and Skoda will use the architecture for future SUVs. Equipment: Standard safety features include a radar-based automatic braking system if a collision is imminent and post-collision braking, which automatically stops the car to avoid a second impact. Connectivity: Features such as BeatsAudio and Apple Car Play are well suited to the Arona's young customers, Seat says. The Amazon Alexa digital assistant will be available in 2018. Engines: The Arona's 1.0-liter compressed natural gas (CNG) engine, due in 2018, will be the only such option in this segment.